Each week, Voice of Russia hosts Red Line, a discussion about the events of the week, as seen from Moscow. This week, troubles in Yemen, will vegetables bring down the EU, and Ban Ki-Moon signs up for another five years. Ekaterina Kudashkina: This week we will start with Yemen, which is sliding into chaos as its embattled and injured president, Ali Abdullah Saleh, remains in Saudi Arabia. We will then turn to Europe to discuss the food safety issues in the EU after the “cucumber scare,” and the hero of our program today will be Ban Ki-moon, UN Secretary-General, who has announced that he will run for a second five-year term. Now our first section – Beyond the Headlines. It seems that Yemeni President Ali Abdullah Saleh might be living through the end of his 33-year-long rule. Who could imagine that just six months ago? Sergei Strokan: I couldn’t. I think if you didn’t follow these Yemeni events, you might feel sorry for him. Mira Salganik: I am afraid I have to disagree; his road to power doesn’t inspire compassion. You know, there was South Yemen, which was oriented towards Moscow, and there was North Yemen, which was supported by the West. After the collapse of the Soviet Union, South Yemen was on the rocks, and at that time Saleh stepped in. Mira Salganik: It is a face-saving thing. Do you really believe that he can return to Yemen? Let us be frank, President Saleh has already been written off both at home and abroad. Sergei Strokan: Definitely there is a temptation to draw parallels. But Yemen is a much bigger powder keg than Libya. The population of Yemen (25 million) is more than four times that of Libya, which is only 6 million. And these 25 million Yemenis hold 60 million guns. The second point is that Yemen is the only Arab country in which tribal military units possess more heavy weaponry than the regular army. This is another striking difference from Libya with its rag-tag opposition forces, which can fight with NATO support. Ekaterina Kudashkina: I’ve seen some reports saying there are Al-Qaeda units and other terrorist groups operating freely, and Al-Qaeda training camps mushroomed in barely controlled Yemeni South even in President Saleh’s glory days. Sergei Strokan: Yemen is a country that for decades was the main recruiting camp for Al-Qaeda soldiers. For just $200 per head, one could easily employ any required number of militants to be sent wherever they were needed. Islamist leaders feel themselves comfortable, safe and secure in Yemen. And finally Yemen has become a home for 2 million of Somali refugees, many of them with strong links to Somali pirates. As one of the leading Russian experts in the Middle East told me, the Gulf monarchies should pray that Yemen’s strife doesn’t spread beyond its borders, since this is the only chance for the moderate Arab regimes to survive. Ekaterina Kudashkina: Today all eyes are not on Yemen, but on Libya, and it seems the world community has not yet woken up to the new challenge of Yemen. I suggest that we talk to Dr. Abdullah Baabood, Director of the Gulf Research Foundation in Cambridge. Ekaterina Kudashkina: Dr. Baabood, do you think that Mr. Saleh is in full control of the situation in the country? Dr. Abdullah Baabood: He is and he is not. The armed forces are loyal to him, and he still has some loyal supporters within the apparatus that are around him, but other parts of the country, I think, they are no longer under his control. 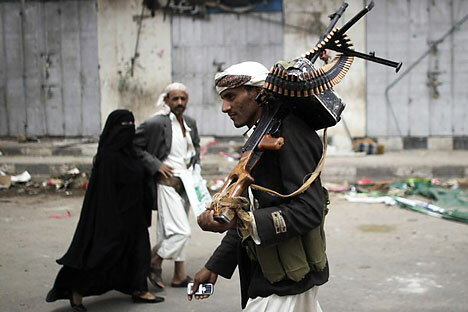 They are under the nominal control of the Yemeni state, but not necessarily under his direct control. He is losing in a number of areas and he is trying to at least keep some control over the capital and surrounding areas, but not necessarily over the whole country. Ekaterina Kudashkina: So Mr. Saleh has actually lost control over certain locations, but then who is taking control there? Dr. Abdullah Baabood: The areas are still under the nominal control of the country; there are some other local institutions that keep the country together. There are no other groups in Yemen that can be said to be contending with him. Of course there is al-Qaeda, but I think what is going on in terms of the youth revolution is undermining their message and their methods. People can see that they can affect change through peaceful means and through popular revolt, and the old style of al-Qaeda and other extremist groups of violence does not appeal to the public. Ekaterina Kudashkina: What about the tribal conflict in this situation, what role does it play? Dr. Abdullah Baabood: The two major tribes in Yemen are the Hashid and Bakil, but I think everybody wants to continue the peaceful transition, the peaceful revolution despite the fact that these tribal groups have enormous power in terms of number of people and also in terms of weapons. But what is really pleasing is that this revolt of the youth has been extremely peaceful. The people have not been violent even though they have their own weapons, and despite the fact that Saleh’s regime has tried to antagonize them and draw them into some kind of a conflict. I think that it shows that the Yemeni population is mature and they basically want a peaceful transition. Given what is going on around them in the Middle East, in the Arab world, in the Arab spring, people in Yemen long to change, and may be they will. Ekaterina Kudashkina: And now we are moving to our next section – Between the Lines – in which we usually look at one of the most interesting publications of the past week. This time it’s going to be a story The Daily Telegraph ran under the title of “The cucumber war is warming up nicely – and we'll all pay the price,” written by David Hughes. I’ve chosen it both for the essence and the style. It certainly looks like the recent cucumber scare has highlighted some of the most sensitive EU realities. Sergei Strokan: The scandal seems to have caused panic beyond the European Union, too. Russia was quick to introduce a ban on imports of raw vegetables from the European Union, obviously including cucumbers. Very briefly – the outbreak that started in the north German city of Hamburg killed 30, infected 2,400, and led to an international row over the source of the contamination. Ekaterina Kudashkina: Germany has been strongly criticized for its reaction to the outbreak. First, it accused Spain. Mira Salganik: And the cucumber scare came at a difficult moment for Spain. Sergei Strokan: Spain has been struggling with a host of economic problems, and farming is one of the key sectors in the Spanish economy. Ekaterina Kudashkina: On Monday, Spain's fruit and vegetable exporters association said as a result of the cucumber scare the industry was losing 225 million euros per week, with producers saying prices were down 35 percent since May 27. And they also said that due to the scandal some 70 000 people could be out of work. Ekaterina Kudashkina: What impressed me in this story is that how defenseless the public and the market are in the face of any political rhetoric. Now we are joined by Timofei Bordachev, Director of the Center for Comprehensive European and International Studies in Moscow. Timofei Bordachev: First of all, I should say that everyone is terribly emotional in international affairs now. I think that we should consider emotions as a very natural part of foreign political and economic relations, and that can be particularly applicable to this terrible cucumber story. Ekaterina Kudashkina: But if we try to focus more on figures and reason in general, how do you think this could affect the agricultural sector in Europe, or could it affect? Timofei Bordachev: The thing is that we should clearly assume that agriculture is one of the core sectors of the European economy. Despite the huge advancement in terms of the service industry; economic development; in some countries the manufacturing sector; agriculture is still the core of the economy, especially in countries like France, Germany, and most of Southern Europe. Agriculture is a sector of the economy to which the European Union spends the lion’s share of its common budget, so, agriculture has been always in the heart of the European integration, and interests of agricultural lobbies have been always at the heart of European integration and the political process in the European Union. Ekaterina Kudashkina: Do you think that this case might be somehow connected to one of the players’ agricultural interest? Timofei Bordachev: I believe that, first, this cucumber story is a general reflection of the political and intellectual mess in which the European Union is. Europe is in a political crisis and a crisis of its role in international affairs. The feeling of its own irrelevance grows in Europe, and that makes Europeans very nervous and very emotional. Ekaterina Kudashkina: What could be political implications of the situation within Europe? Timofei Bordachev: The main political implication is going to be the further decrease of trust between the European Union member states. Ekaterina Kudashkina: What about the discussion of reintroducing borders within the European Union in the long run? Timofei Bordachev: This is the part of the same story. Europe used to have ups and downs in its integration, but we should always remember that these ups and downs back in 1960s or 1970s took place in a comfortable international environment when Europe was protected by a firm American presence on European soil and by the bipolar system of the international relations. Now Europe is entering a political and economic crisis under the conditions in which the international environment is much less friendly to Europe. That makes things more complicated to resolve. I do believe that European integration and the European political system has potential to survive this crisis, but I do not think this is the beginning of the end of the crisis, I think it is end of the beginning of the crisis. Ekaterina Kudashkina: Brussels has described the decision by Russian authorities to impose the ban on imports of agricultural produce from the European Union as overreaction. Do you agree with this? Timofei Bordachev: Definitely, yes. In technical terms, it is one of the major responsibilities of the Russian government to make sure that Russian citizens are protected, at least from the threatening challenges to their health coming from outside of the national borders. Politically, I think this decision was quite natural because of reciprocity. Russia used to face numerous – even at times unmotivated – restrictions imposed by the European Union on many kinds of Russian goods or services. So, Russia is now playing by the same rules as Europe played for many years. Sergei Strokan: Doesn’t it look strange? This perfectly smooth sailing to what is considered the top posting in international politics? Does it mean that no UN member-country is interested in promoting its representative to this position? Or that the present Secretary-General is a person of such authority and competence that no one else dares to contest his candidacy? Ekaterina Kudashkina: Tygve Lie said this in 1953; time has not made the job any easier. Moreover, the prestige of the UN seems to have been steadily waning since then, so that now the organization is often called ineffective though indispensable. Sergei Strokan: Ban Ki-Moon’s election seems to be inexplicable, if you take a look at his performance in his first term. Not only is he rather low-key in his approach to problems and inarticulate in his statements, but his many statements on grave developments in the world are so bland and non-committal that the media, especially in the western world, would hardly ever quote him. In a world torn by conflicts and escalating polarization, UN Secretary-General Ban Ki-Moon hasn't had any spectacular successes over the past four years. Mira Salganik: He is an absolutely faceless man, but all through his first term as the UN top official, Ban managed not to run afoul of Russia, the UK, the United States, China or France. Sergei Strokan: But let us be fair. Ban Ki-Moon did a good job in Darfur when he helped persuade Sudanese President Oman al-Basheer to allow peacekeeping troops to enter Sudan. He also did well on global warming, pressing the issue repeatedly with former U.S. President George W. Bush. Sergei Strokan: It goes without saying that the UN is badly in need of reforms. In fact, the reforms are long overdue – it has to be brought in compliance with the changed times and the new balance of powers. I don’t think I have to elaborate on it, since it has been on the cards at least for a decade – if not more. Yet, I believe the re-election of Ban Ki-Moon evidently postpones all serious reform for at least five years! And this is a problem. Mira Salganik: Then, the question is – who wanted it? Ekaterina Kudashkina: This is the key question that we must pose to our expert - Nandan Unikrishnan, senior fellow at the Observer Research Forum in New Delhi, India. Nandan Unikrishnan: I am not a UN diplomat, I do not understand much of the intricacies, but one thing is quite clear – if any single candidate gets the support from the five prominent members, anyone else is actually unelectable. Secondly, no UN Secretary General announces that he is going to stand again for reelection unless he has secured the support of the Big Five. Ekaterina Kudashkina: Is it a positive development for the United Nations? Nandan Unikrishnan: I don’t see it negatively. Obviously no country has any other credible candidate that they are willing to put up. Given the current structure of the United Nations and given how it functions today, I do not think there is any negative element. Ekaterina Kudashkina: There has been a lot of talk about a need to reform the United Nations, but over the last four or five years, I do not think we have seen any attempt to reform it. Nandan Unikrishnan: I do not think UN reform is entirely in the hands of the secretary-general, I think that the problem with UN reform is the inability of all members to arrive at an understanding of what exactly they mean by “reform.” One of the very sticking points is the issue of the expansion of the Security Council, because there are countries that are claiming a place, like India, Brazil, Germany, Japan, all of them are claiming a place in the Security Council as prominent members and are suggesting that as part of the reform the expansion of the Security Council should take place. But why would the Big Five like to dilute their powers by bringing new permanent members with the right to veto into the Security Council. It is a question of how to bring about that reform so that their interests are also looked after. Ekaterina Kudashkina: But this actually implies that we are arriving at a dead end, because I think the lack of reforms and the waning influence of this organization are interconnected, so if the status quo is preserved, it means that the influence will be still waning. Nandan Unikrishnan: You are absolutely correct. If this carries on like it is going on, it will arrive at a dead end. But you have to take into consideration that global equations are changing, there are new powers that are rising, their ability to influence issues is growing, and therefore that will have to be taken into account. If you look at India and China, by 2050 they are likely to be the two largest economies in the world. But there is little doubt that the world will have to adjust, and when we have all these crises emerging in the world, whether it is in the Middle East, or in North Korea, or any other, there will be definite need for a global body that can look at all these issues and look at some norms of global governance that can be implemented. Currently there are suggestions that maybe the G20 is a good place, but I do not think that there is anything better than the United Nations, and in that sense I am an optimist. I think eventually in the next five to seven years the reforms will happen.